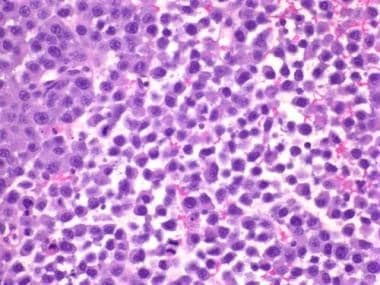 Plasma cell lesions are the neoplastic (clonal) proliferation of plasma cells involving single bones (plasmacytoma) or multiple bones (multiple myeloma). 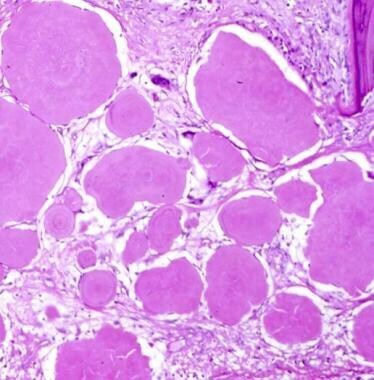 Osseous solitary plasmacytoma of bone is a localized bone tumor of plasma cells, without evidence of plasma cell myeloma or marrow plasmacytosis. Extraosseous solitary plasmacytoma of bone is a localized, soft-tissue plasma cell neoplasm that occurs in a location other than the bone and does not have evidence of plasma cell myeloma or marrow plasmacytosis. A computed tomography (CT) scan demonstrating myeloma is provided below. 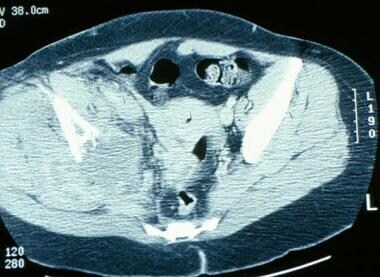 Computed tomography scan demonstrates a destructive lesion with an associated soft-tissue mass. This image depicts myeloma. Plasma cell neoplasms show a spectrum of disease from asymptomatic to symptomatic forms. In either form of plasma cell myeloma, immune dysfunction, cytopenias and lytic bone lesions occur as a result of direct cellular interactions (cytokines, growth factors) and/or mass effect. Readers are referred to the 2008 World Health Organization (WHO) Classification of Tumors of Hematopoietic and Lymphoid Tissues  for the specifics of each clinical entity. The key clinical features will be covered in this review. Plasma cell myeloma presents with generalized marrow involvement, with or without lytic lesions of bone. It tends to involve bones of active hematopoiesis, most commonly the vertebral column, long bones, and skull. [1, 3] When present, extramedullary involvement is generally a feature of clinically aggressive disease. Hypercalcemia results from the increased osteoclastic activity, with resultant lytic bone lesions and pathologic fractures (see the image below). [1, 5] Renal insufficiency is due to hypercalcemia and monoclonal light chain–induced injury to the kidney. Microscopically, the morphologic features are similar for plasma cell myeloma and solitary plasmacytoma of bone. Normally, plasma cells reside in the marrow and represent less than 1% of nucleated cells. In plasma cell neoplasms, a clonal population of plasma cells proliferates, forming a tumor either in bone or soft tissue. Bone marrow biopsies will show sheets and clusters of plasma cells, with either focal or diffuse marrow involvement. [1, 4] A CD138 immunohistochemical stain can be used to aid in quantifying plasma cells (in core biopsy or clot sections) in diagnostically challenging cases (see Immunohistochemistry). Plasma cell myeloma is a likely consideration if greater than 30% plasma cells or the presence of a tumoral mass of plasma cells is seen. The number of plasma cells can be quite variable on marrow aspirate smears, from scattered and more limited in number to markedly increased in number with focal clustering. See the images below. Histology shows sheets and clusters of atypical plasma cells and plasmablasts. The cells have eccentric nuclei and a clock-face-like chromatin. The cytoplasm is usually eosinophilic owing to the protein production in myeloma. A by-product of these tumors is the production of amyloid. On routine hematoxylin and eosin (H&E) sections, amyloid appears as eosinophilic, amorphous deposits. Special stains are helpful in identifying these deposits. 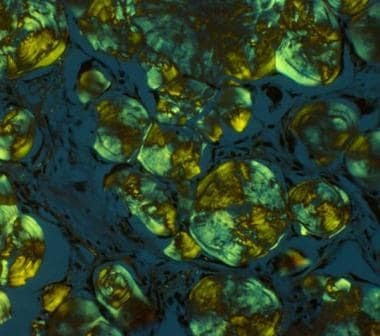 Examination by polarized light reveals an apple green coloring to the amyloid. This is often a helpful adjunct in interpreting suspected cases of amyloid deposition. 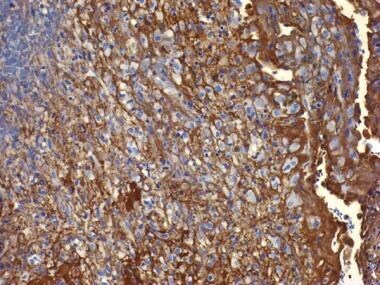 Immunohistochemistry is useful in demonstrating the clonality of the lesion. Occasionally, the stains can be hard to interpret, but in general, either the kappa (pictured here) or the lambda light chain will show positivity. If both stains are positive, a tumor diagnosis should be questioned. 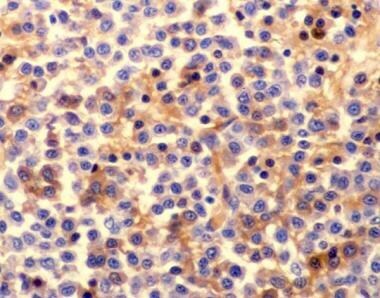 Immunohistochemistry for lambda light chains is intensely positive, and in the presence of a negative kappa light chain stain, helps in the identification of the diagnosis. Correlation of the immunophenotype with clinical, radiologic, and morphologic features will aid in distinguishing these entities from plasma cell myeloma or solitary plasmacytoma of bone, as well as in distinguishing plasma cell myeloma from solitary plasmacytoma of bone. Plasma cell myeloma with a hyperdiploid karyotype (ie, without recurrent translocations) tends to have a better prognosis. Swerdlow SH, Campo E, Harris NL, et al, eds. WHO Classification of Tumours of Haematopoietic and Lymphoid Tissues. 4th ed. Geneva, Switzerland: IARC Press; 2008. Kyle RA, Rajkumar SV. Multiple myeloma. Blood. 2008 Mar 15. 111(6):2962-72. [Medline]. [Full Text]. Podar K, Richardson PG, Hideshima T, Chauhan D, Anderson KC. The malignant clone and the bone-marrow environment. Best Pract Res Clin Haematol. 2007 Dec. 20(4):597-612. [Medline]. Gorczyca W, Weisberger J, Emmons FN. Atlas of Differential Diagnosis in Neoplastic Hematopathology. New York, NY: Taylor & Francis; 2003. Jagannath S. Pathophysiological underpinnings of multiple myeloma progression. J Manag Care Pharm. 2008 Sep. 14(7 Suppl):7-11. [Medline]. Leukemia & Lymphoma Society. Facts and statistics: myeloma. Available at http://www.lls.org/#/diseaseinformation/getinformationsupport/factsstatistics/myeloma/. Accessed: April 28, 2011. Cook R. Economic and clinical impact of multiple myeloma to managed care. J Manag Care Pharm. 2008 Sep. 14(7 Suppl):19-25. [Medline]. Sigurdardottir EE, Turesson I, Lund SH, et al. The role of diagnosis and clinical follow-up of monoclonal gammopathy of undetermined significance on survival in multiple myeloma. JAMA Oncol. 2015 May. 1(2):168-74. [Medline]. Hackethal V. Multiple myeloma: better survival if precursor state is known. Medscape Medical News from WebMD. Available at http://www.medscape.com/viewarticle/841369. March 12, 2015; Accessed: October 26, 2015. Schwartz RN, Vozniak M. Current and emerging treatments for multiple myeloma. J Manag Care Pharm. 2008 Sep. 14(7 Suppl):12-9. [Medline].